We know that commercial window cleaning can be a challenge to organise. 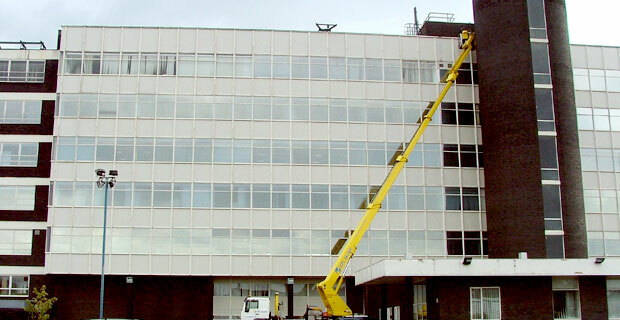 National Cleaning Services have been cleaning windows in commercial settings in the West midlands area for 100 years. We are a company that you can trust to be reliable, on-time and get the job done. We specialise in commercial window cleaning and are able to work outside at high and low levels. Higher level and some lower level windows are cleaned on the outside by the water fed pole method which means your windows are cleaned from the ground therefore avoiding the use of ladders. Purified water is pumped from our vehicles through telescopic poles up to 80 ft. The glass is cleaned by our operative through the activation of the either mono-filament or flocked bristle brush on the surface of the glass. This is then followed by thorough rinsing leaving the surface clean and clear of dirt and stains. This method is safer, more efficient and cheaper than older conventional methods and reduces the rises of accidents and falls. For buildings higher than this we use lorry mounted access platforms or possibly access cradles where fitted. Inside work is done including windows and internal partition glass around offices is generally cleaned manually by blade and applicator. Our internal cleaning team will be able to work around your office hours to avoid disruption. To get a quotation on your requirement please request a quote and a member of team will get in touch to talk details.